Blockchain may be the right tool to allow Internet of Things (IoT) deployments to achieve their full potential. Mention blockchain in the watercooler chat, and odds are that it evokes notions of cryptocurrencies, like Bitcoin, and covert financial transactions. But in the enterprise world, blockchain is much more than an ultra-secure, digital financial ledger or another “over-hyped” new technology. Before diving into this subject in more detail, let’s begin with the definitions. In a basic sense, blockchain is a decentralized ledger that allows multiple parties to records transactions between them efficiently, securely and permanently. Once recorded, it is impossible to manipulate information within the blockchain. Thus, blockchain becomes a single source of truth for the transactions without a need for a third-party validation and verification. Easy enough, right? So, how does blockchain relate to IoT? In the enterprise, the value of IoT comes from the data that connected devices generate. This data can be analyzed and turned into solutions that drive operational improvements and create new value propositions and markets. For example, by analyzing the data streams from IoT connected machines on the plant floor, manufacturers can implement predictive maintenance solutions, and therefore, increase uptime. In many use cases, such IoT data traverses across organizational boundaries and even multiple enterprises – giving practitioners a “big picture” view of their operations. The challenge is ensuring this data is accurate, consistent, trustworthy and most importantly, secure. Further, reconciling such data is a time-consuming process, especially when done manually, involving data sets from disparate sources that often do not match. Here’s where blockchain can help. As we said, blockchain facilitates the seamless, permanent and decentralized recording of IoT data transactions across devices and even across entire organizations. Let’s explore a few use cases. Let’s start with supply chains. 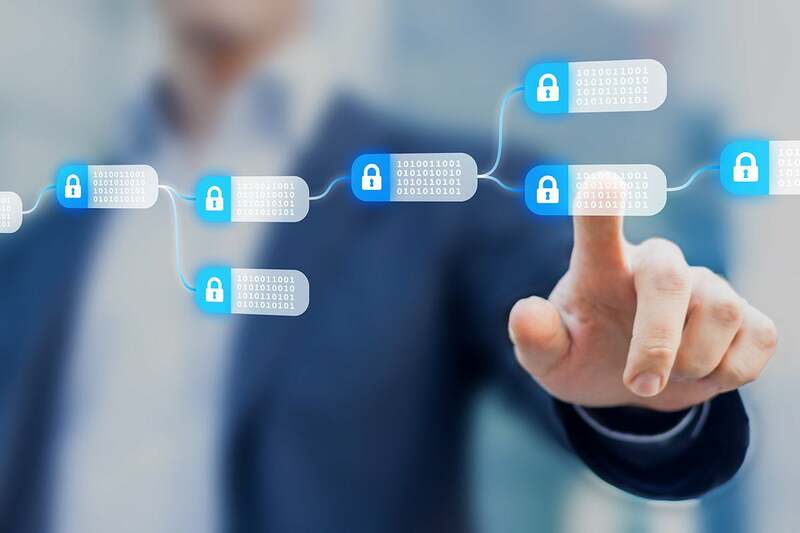 In such complex and multilayered ecosystems, blockchains can alleviate many track-and-trace challenges, for example, helping to minimize the impacts of counterfeiting, product recalls and foodborne illnesses. Counterfeiting is a massive problem across most industries. In the semiconductor industry alone, counterfeits cost U.S.-based chip manufacturers $7.5 billion in lost revenue per year. By using blockchain technology, semiconductor manufacturers can create an incorruptible chain of custody for a chip as it traverses through each step of the supply chain. If a chip is believed to be a fake, the manufacturer can trace it through that chain of custody and assess where a counterfeiting incident occurred. The same method can be applied to faulty chips. Similarly, the food industry can refer to the blockchain to pinpoint the origin and track the location(s) of tainted goods, facilitating and even preventing health hazards and devastating recalls. The sheer speed of transaction reconciliation is crucial, allowing food manufacturers and distributors to have immediate visibility into their supply chains. Walmart demonstrated such capability by tracing a package of mangos back to the farm from which it originated. With blockchain and IoT, the process took just 2.2 seconds, whereas it would have taken nearly seven days using traditional digital and paper-based methods. But blockchain and IoT also hold great promise for creating new value propositions. Take reconciling health records as an example. With an instant, accurate and secure view of a patient’s medical history, doctors can ensure they do not prescribe a medicine that could adversely impact the patient, based on past or present medical conditions. This use case could lead to greater patient safety and improved health outcomes. We’ve only scratched the surface of blockchain’s capabilities, especially when it is paired with IoT – and the future looks bright. In fact, the global blockchain technology market is expected to reach $7.59 billion by 2024, at a 37.2% CAGR. However, a majority of today’s blockchain efforts are still in technology discovery and proof-of-concept stages. To meet the enterprise requirements, we will need the industry to develop solutions based on established frameworks that will allow interconnectivity between disparate blockchain networks. Such solutions should be highly scalable and provide deployment flexibility, fine-grained information confidentiality, and strong security with predictive threat analytics and collusion control. And of course, they need to deliver real-life performance appropriate for the use case. In the meantime, I would encourage IoT practitioners to explore how blockchain can apply to their data flows and specific use cases to determine whether blockchain is the right tool to solve their problems – and whether it is truly the missing link in their IoT deployment. Maciej Kranz is Vice President of Strategic Innovation at Cisco Systems and one of the world's leading experts on the Internet of Things (IoT). He is the New York Times-best-selling author of "Building the Internet of Things".